MSV: Water receding as the pump, pumps us out. Cars entering residents only? Water receding as the pump, pumps us out. Cars entering residents only? The NHSA pump is operating and midtown west is seeing the benefit with a lowering of the flood levels. Some areas are clearing and the area around 9th and Jackson Street is cleared. County officers are letting in Hoboken residents only but if told people are picking up others, they should be able to get in. This report is unconfirmed. The Shoprite area is still generally inaccessible but the surrounding area is improving and people are managing to get out and about. Hoboken Public Safety is doing a superb job aiding people all over town and working with the National Guard to help people evacuate. CHARGING STATIONS AT 606 HUDSON ST - 730 HUDSON ST - 11TH AND PARK VICINITY - ST MATTHEWS PARRISH CORNER 8TH AND HUDSON. Most of the City is without power. Halloween is a limp decoration in town with the parade postponed until further notice. 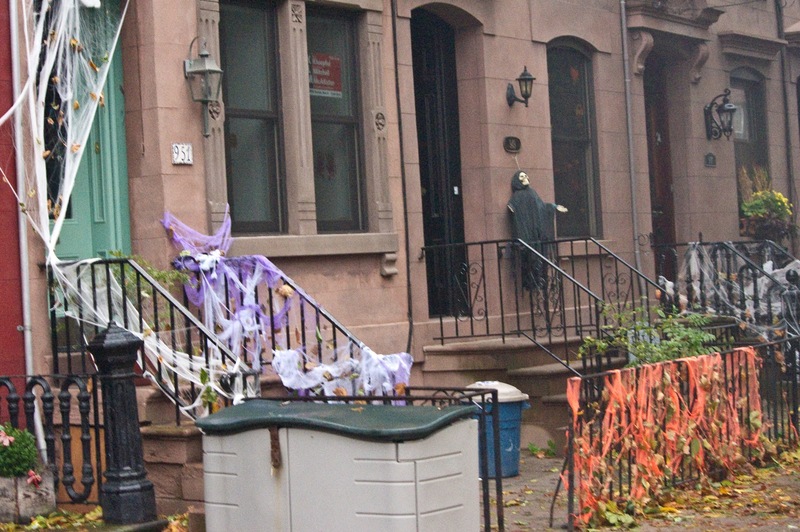 Halloween is soggy in Hoboken like these decorations gone limp after Hurricane Sandy. Talking Ed Note: This is where the challenges mount and grow. Hang tough folks and lend a hand if at all possible. People need help at St. Matthews - Hudson and 8th, Sts Peter and Paul - Hudson and 4th and down at City Hall - 94 Washington St.